SAITAMA - Kiyoshi Ueda, 55, a former House of Representatives member, won the Saitama gubernatorial election Sunday, early returns show. Ueda will fill the post vacated by Yoshihiko Tsuchiya, who resigned in July over a political funds scandal involving his daughter. 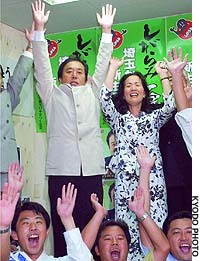 Ueda gave up his Diet seat and resigned as vice secretary general of the Democratic Party of Japan, the largest opposition force, to run as an independent. He defeated seven other candidates in the closely watched race. Voter turnout was 35.8 percent, much lower than in the previous election, the prefectural election board said. The race was widely considered to be a litmus test for the House of Representatives general election, which could take place as early as this fall. The Liberal Democratic Party’s local branch officially supported Akira Shimazu, 60, former vice minister for public management, home affairs, posts and telecommunications. However, the top LDP leadership refused to commit itself to the branch’s decision. The New Conservative Party alone gave official support for Shimazu. All eight candidates ran as independents to in an attempt to win support from voters with no party affiliation. Sunday’s election result shows that independent voters play a decisive role in elections in big cities, political pundits said. The win should also give a major morale boost to the leadership the DPJ, which has announced a merger with the Liberal Party to prepare for general elections this fall, they added. Among the seven other candidates, another lawmaker gave up his Diet seat to run. Takujiro Hamada, 61, a New Komeito representative who left his seat in the House of Councilors, also contested the Saitama election. Other candidates included former Cabinet Office gender bureau chief Mariko Bando, 57; former Saitama Municipal Assemblyman Tomosuke Sugisaki, 40; and business executive Morio Kato, 62. Former Saitama Prefectural Assemblywoman Misako Takahara, 60, ran with the support of the Japanese Communist Party, and businessman Setsuo Yamaguchi, 53, was backed by a minor party. 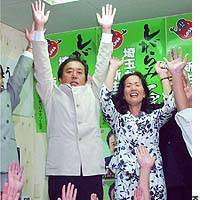 Tsuchiya resigned as governor July 18 over a scandal in which his daughter Momoko Ichikawa was arrested and indicted on suspicion of misappropriating 116 million yen in political funds donated to Tsuchiya between 1998 and 2002. Each candidate has been calling for reform of the prefectural administration, but all have generally shied away from tackling any other serious issues.